...calendar, Masson was unable to assure himself as to a true equivalent for the latter, but Dr. Bailey informs us that May 23rd would probably be correct, while either May 22nd or 24th would also be possible. (This date must now be put back by two months.) Up to the present, April has generally been accepted as the month of issue; but we have seen covers bearing dates in March, of which the 25th is the earliest. These had all been used in the Kashmir Province, the earliest record for Jammu appearing to be May 30th. The stamps on all these covers had been closely cut round the outer circle prior to posting, so that this philatelicly regrettable practice was commenced by the natives from the earliest days. The reason for the practice is, however, an interesting one. Correspondence was charged for by weight; hence we find all the early covers to be smalloften excessively soand made of the thinnest tissue paper: and we are informed by Col. Stuart Godfrey that, but for the removal of the heavy native paper surrounding the printed design of the stamp, an appreciable proportion of letters would have failed to travel for the minimum ½-Anna rate. The earliest circular printings were made in greyish-black and in shades of blue, shortly followed by others in indigo, and were intended for joint use by both Provinces, though not all of them are known to have been actually issued to both. Before entering into an examination of these, it becomes necessary to refer briefly to the Old Rectangular stamps which began to supplement the Circulars at about the time when the latter were being printed in indigo, owing to the decision that each Province should have its own distinctive stamps. It had, probably, been the original intention that these should supersede the Circulars, but the intention was only carried into effect in the case of Kashmir, where the use of Rectangulars in place of Circulars commenced soon after August, 1866. The first Kashmir rectangularwas a ½-Anna single-die, and this superseded the ½-Anna black circular at least as early as October, 1866. Subsequently Kashmir received a second Composite Plate composed of ¼-Anna and 2-Annas denominations, and also two single dies for 4-Annas and 8-Annas stamps. Of these, the 4-Annas superseded the last of the Circulars, and the Kashmir Province was now provided with sufficient rectangular dies and plates to enable it to produce all the stamps required. As far, therefore, as Kashmir Circulars are concerned, the ½-Anna were only employed for some seven months; the 1-Anna for about a year and a half, and the 4-Annas for about a year. The Jammu Circulars and Rectangulars. In Jammu a very different state of affairs prevailed. Circular stamps were here used for some twelve years and, with the exception of about the first year, concurrently with the Jammu Rectangulars. Masson expressed surprise at this circumstance, but the explanation appears to be fairly obvious; for, whereas Kashmir was amply provided with dies and plates, including all denominations up to 8-Annas, Jammu received only one small and wholly inadequate Composite Plate capable of printing three ½-Anna and one 1-Anna stamps at a time. It appears to us inconceivable that the requirements of the Province could possibly have been dealt with by printings from such a plate, and we find, in fact, that Jammu was forced to supplement such printings by others from the Circular dies which did, at least, include a 1-Anna denomination. After this digression, we return to the early Circulars prepared for joint use in both Provinces. (a) The Circular Stamps. The Printings in Grey-Black. The ½-Anna is comparatively common. The 1-Anna is very rare, whether unused or used, and was not even known in Europe until May, 1869, when it was shewn at the first General Meeting of the London Philatelic Society. It has not, as yet, been found used in the Jammu Province. The 4-Annas was also printed in grey-black, and has appeared, cheaply priced, in catalogues for many years. Notwithstanding this, we propose to classify this stamp as one “prepared for issue” only, on the grounds that there appears to be no evidence of any copy known in used condition. No authentic used example was found in Masson’s collection, nor in those formed by Evans, Séfi, Hancock, or Worthington. The same applies to the Tapling Collection in the British Museum, while Mr. R.B. Yardley, Mr. F.C. Earl, and the late Mr. Dorning Becktonall owners of fine collectionsinformed us that they had never possessed or seen a used specimen. Masson himself never stated that he had seen one, and his collection only contained an unused copy; this fact is the more significant since Masson’s principal research work depended on the study of used stamps which he never failed to acquire at every possible opportunity. Dr. Legrand at first listed the stamp, but suddenly ceased to do so in 1875. At the same time he also deleted from his list a “4-Annas green,” now known to have been the “Die I.” forgery: and as it would be most unlikely that so eminent a philatelist as Legrand should have listed a genuine 4-Annas black and a forged 4-Annas green without noticing the differences in design, it would appear to be a fair inference that the simultaneous disappearance of both from his list was due to his recognition of the 4-Annas black as a forgery also. In any event, Legrand does not appear to have ever seen it used. Pemberton, again, must also have had doubts as to the status of the stamp, for it was not until 1872 that he first included it in his list; and here, again, there is no evidence that he ever saw a used specimen. Mr. Earl, whose opinion we invited owing to the fact that he himself had constantly corresponded with Evans in relation to Kashmir problems, was, at first, strongly averseas, for that matter, are we alsoto denying what so eminent a philatelist as Evans had accepted as an established fact of some forty years standing: but in view of the evidence now available, there appears to be no alternative, and this is now Mr. Earl’s opinion also. The stamp must therefore be classified as one “prepared for issue,” unless, and until, an authentic used copy can be discovered. The stamp is fairly well known unused, though far rarer than present-day catalogues suggest. There can be no doubt but that it was in existence during 1869 and, probably, in 1868. In general appearance it closely resembles the rare 1-Anna of 1866-67, and has none of the shiny and intense black of the “Special Printings” of 1874-76. (b) The Printings in Blue. 1866-67. The 1-Annas and 4-Annas in Ultramarine and Blue-black. 1874-76. The ½-Anna, 1-Anna and 4-Annas in Bright blue. (II.) Special printings of 1874-76. (iv.) ½-Anna : 1-Anna : 4-Annas  Bright blue. This classification was never adopted, possibly because it was considered that the material then available was insufficient to justify the suggested alterations. Fortunately the “Masson” collection was found to contain several most important dated covers, franked with some of the rarer printings which confirmed the correctness of the classification and which enable us finally to adopt it. (c) by the adoption of “Blue-black” to describe a hitherto unrecorded stamp of 1876. (i.) Royal blue  (March-April, 1866.)  1-Anna : 4-Annas. The term “Royal blue” is somewhat arbitrary and has been loosely applied, even by artists, to more than one hue of colour. For our purpose it is to be understood as a rather deeper but exceptionally more brilliant shade than that of ultramarine which is quite dull by comparison. The stamps were superseded by those in paler ultramarine after barely a month and are, consequently, rare. We have never seen an unused copy of either denomination. In used condition the 4-Annas is extremely rare, but a fair number of 1-Annas are known. The earliest known date for Royal blue is 25th March, 1866, and the latest, taken from a cover in the Yardley collection, 12th April. We may add, incidentally, that the earlier of these dates may have actually been the first day of issue of Circular stamps, for the earliest known date of the ½-Anna blackthe denomination not not included in early printings in blueis also 25th March, 1866. It may be considered remarkable that the Royal blue printing was, though printed in Jammu, never, apparently, issued in that Province, all known specimens shewing the small red seal obliteration of Srinagar. We shall, however, bring forward evidence tending to prove that, during the first seven or eight months, the only stamp issue in Jammu was the ½-Anna black. (ii.) Ultramarine (shades) May(?) 1866-67 1-Anna : 4-Annas. ...there were only three towns in the State possessing Post Offices, and that the postage-stamp system, based on a minimum ½-Anna rate, was more or less on its trial. The normal 4-Annas ultramarine raises an interesting problem to which there is, at present, no solution. With this one exception, the highest of the three denominations was always the one for which there was least demand; but the 4-Annas ultramarine is a common stamp in used condition, while the corresponding 1-Anna is rare. This very considerable employment, which occurred in both Provinces, is the more inexplicable, in that single stamps and even pairs and strips are commonly found on the tiny tissue-paper covers which, with their contents could scarcely have required even a 1-Anna stamp to fulfil the requirements of any known postal rate. Such covers disclose no evidence of any special charge, such as for Registration or for Excess Postage; and among many covers of this period which we have examined, whenever postage has been excessed, the excess has rarely been more than one, and never more than two annas. That some special and temporary rate was brought into force can scarcely be doubted; but the complete lack of Official Records of any description leaves the explanation of so great a demand for the 4-Annas ultramarine a matter of conjecture. (iii.) Indigo. (Previously termed “Blue-black.”)  1867  1-Anna : 4-Annas. ...that the same pigment was employed for simultaneous printing of both Circulars and Rectangulars. A 4-Annas specimen on cover, also from the “Masson” collection and used in Kashmir, is dated 30th January, 1868. 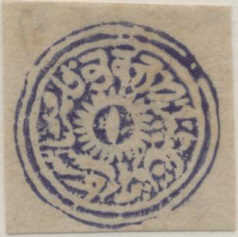 This stamp was used in company with a ½-Anna ultramarine watercolour rectangular stamp from the Kashmir Plate. Against it Masson had written, “This combination of circulars and Rectangulars is common enough during the period of the re-issue of the former at Jammu (1869 or 1870-1878) but is very rare in the first issues.” With this opinion we are in agreement. The use of 4-Annas Circulars of any description in Kashmir was confined to some thirteen months, they having been rendered obsolete in April 1867 by the 1-Anna rectangular of the first Kashmir Composite Plate. [Copyist’ note: Of course the 1-Anna Kashmir did not supersede 4-Annas circulars, which the authors thought were of 1-anna denomination.] The Masson cover of January, 1868, affords, therefore, only one of many similar instances, such as must always be expected, of a stamp used somewhat beyond its true issue-period. whereas stamps of the Special Printings of 1874-76 are fairly common unused and very rarely found used, we strongly incline to the belief that they were part of the printing of 1867. The close of the first period of the blue Circulars is marked by an occurrence of some interest. Masson noted that in 1868, no Circulars whatever were used in the Jammu Province. We have already referred to Circulars used in Jammu during January of that year, and know of one or two other instances. But we have never found such used in any other month of 1868 and can, for all practical purposes, confirm Masson’s statement. The printings, therefore, whether in ultramarine or indigo, ceased at the end of 1867. Before leaving these indigo Circulars we must slightly qualify our new colour-term. The old description “blue-black” was a most misleading one, but “indigo”, also, is not exactly accurate. True indigo is, in fact, slightly greener than the colour of these Circulars, as it is, also, of the same colour in which some of the Jammu Rectangulars were printed. In other words the colour of both of these groups is indigo slightly tinged with violet. II. Special Printings of 1874-76. (iv.) Bright blue : ½-Anna, 1-Anna, 4-Annas. These must be passed over for the moment since they raise a number of debatable points which can only be discussed later. It will be sufficient to note, at this stage, that we have now reached a much later group of blue Circulars having no connection whatever with those previously referred to. (v.) Blue-black. (1876).  4-Annas. The stamp is very rare, and is only known in the 4-Anna denomination. We have five specimens, three of which came from the “Séfi” collection (one via the “Hancock” collection) and two from Masson. Mr. Yardley also possesses an excellent example. All known copies are used and shew the “square black” Jammu seal of 1870-78. We have a single-dated coverthe only one known to usthe date being 12th July, 1876; and we consider that these blue-black circulars which so mysteriously appear at such a period cannot possibly have formed part of any early stock of 1866-67. On the other hand we can conceive no reason why such a colour should have been suddenly introduced towards the close of the “Special Printings.” That the stamp itself was produced to make good a temporary shortage of 4-Anna stamps is, no doubt, probable; for stocks of any particular denomination or colour were, in the case of the Special Printings, peculiarly liable to become suddenly exhausted for reasons which will be disclosed later, but even this does not in any way explain so extraordinary a colour. The first of the Special Printings was made in an intense and slightly brownish-black and the second in bright-blue, and large supplies of both were sent to Europe and elsewhere to meet the demands of collectors. An accidental mixture of these two colours would, certainly, result in some such shade as blue-black, and there may be a bare possibility that this did, in fact, occur, and that the few stamps printed before the mistake was noticed were put into issue. We can, at least, think of no better theory. (1) All Circulars were printed in Jammu. Why, then, was the first printing in Royal Blue issued exclusively to Kashmir? ...Kashmir only? Also, as a corollary, why, for the first eight months or so, should Jammu have supplied Kashmir with two denominations in black, Royal Blue, and Ultramarine, while apparently confining herself to the use of the ½-Anna black only? (3) Why did Jammu suddenly cease to print Circulars about the end of 1867 and, after using none during 1868, as suddenly resume printing in another colour (red) in 1869? Such printings were not, at this period, required by Kashmir, but the need must surely have been a continuing one in Jammu, whose little Rectangular Plate, issued in 1867, proved wholly inadequate for supplying requirements in 1869, and for years afterwards. (4) Why, when all other Dies and Plates of the Native State were engraved “Post of Jammu and Kashmir,” were the Circulars engraved “Dak Jammu,” or “Post of Jammu” only? The fact seems to suggest an original intention to confine the use of Circular stamps to the Jammu Province, in which event they may possibly have been issued provisionally to Kashmir because the Rectangulars destined for exclusive use in this Province had not been ready for issue. This theory is certainly discounted by the fact that the first Kashmir Rectangular die was not simply engraved “Dak Kashmir,” as would have been likely under such circumstances, but the problem none the less remains an interesting one which much needs some solution. not only not be duplicated, but the Kashmir pigments are essentially different in their composition. Problems such as these can only be solved by the discovery of further material in the shape of covers shewing dates from 1866 to 1869. We, therefore, leave these questions to readers in possession of such material, and pass on. During 1867, Jammu, for reasons already submitted, had continued to print stampsboth in black and in bluenot only from its small exclusive Plate, but also from the Circular Dies. From 1868, when red was officially standardised for Jammu, printings in shades of this were, similarly, carried on from Dies and Plates, and, as previously, in watercolour. Masson had little to say of these red Circulars, undoubtedly because he could not obtain the necessary material. The catalogue description“1869-77”leaves it to be understood that the red watercolour circulars were being continuously issued during these eight years, but we are convinced that this was far from being the case. The suggestion that they were purely supplementary to the plate is strongly supported by the dated covers examined by us. These shewincluding all varieties and denominationsno example, whatever, of use, either in 1869, 1870, 1874, or from 1876 to 1879 inclusive; and a single example only of use in each of the other four years! The scarcity of all of them is, in fact, not even yet appreciated; and it follows, since the corresponding red rectangulars are among the commonest of the early stamps, that this wholly inadequate plate of four subjects was made to do the lion’s share of production, and that the circular dies were only impressed into service to meet emergencies. The newly-standarized colour assumed, during its eight years of intermittent employment in watercolour, three very clearly-defined shades, viz. :Red, Orange-red, and Orange. Hitherto no orange Circular has ever been catalogued*. [Correction added by Pemberton in a footnote: *The authors have here fallen into error as Masson noted all these values in orange in the 1900 Handbook, Part I, page 46.Ed.] But we are now able to record an undoubted example shewing a 1-Anna Circular used on an entire with a ½-Anna Jammu Rectangular, both of which stamps are printed in an identical shade of the true watercolour orange. This cover is, moreover, dated November 1872, which coincides with that already known for the orange Rectangular stamps. The orange-red circulars appeared mainly between 1872 and 1875, and are very much rarer than those in red. The combined Masson and Séfi collections contained only a single used example, this being a ½-Anna on cover dated 25th September, 1875. The catalogue expression, “Re-issue for Jammu” is a misnomer for all of these stamps. No previous circulars had ever been issued, either for Jammu or Kashmir, in red; nor had Jammu ever officially discontinued the use of the circular dies. Masson considered that the red watercolour circulars did not immediately supersede those in black and in blue, but that for a year or so following 1867, no circular stamps whatever were used in Jammu; and he therefore gave 1869 as the date of the first issue in red. Evans contented himself with simply recording Masson’s opinion, while adding that only the 4-Annas red was known in Europe until as late as 1874. Masson had, no doubt, good grounds for fixing 1869 as the date of the original issue, though the covers in his collection did not shew any example either of that year or even of 1870, nor have we yet seen any examples used prior to 1871. 1869-77. For Jammu only. Watercolour on Native Paper. In 1874 the standard red was supplemented by watercolour printings, both from the Circular Dies and Rectangular Plate, in black, blue and emerald-green, while the three Circular denominations were also produced in yellow. Masson accounted for this by the theory that the Native officials, having received orders from dealers and speculators for circulars in the pre-red colours, had printed fresh supplies to meet the demand, and that portions of these printings had been reserved and issued. The two new colours, green and yellow, which had never been included among those of the earlier stamps, were accounted for by Masson on the supposition that orders from abroad had included green owing to the then prevalent belief that the “Die I” forgery, printed in this colour, was a genuine stamp; and that yellow had been supplied in an attempt to fill an order for the scarce orange or orange-red circulars. It is now, unfortunately, practically certain that Masson’s opinions were perfectly correct, as we shall proceed to prove later in the chapter when dealing with the much more debatable group of oil-printings. It will be sufficient to add here that many of the stamps were, none the less, issued and, in some cases, freely used for a short period. All could, undoubtedly, have been so used and, for this reason, in those cases where no proof of actual use is forthcoming, we shall classify some of the stamps as “not known used.” All used stamps should shew the obliteration in black from the square Jammu seal. 1874-76. Watercolour on Native Paper. Black. Authentic used copies are known of the ½-Anna only, and these are of great rarity; in unused condition this is the commonest of all the Circular stamps. The 1-Anna and 4-Annas, which are only known unused, are both rare, the former particularlya fact which scarcely suggests that they were made for collectors. The colour of all denominations is usually a more intense black than is found with the stamps of 1866. Some greyish shades of the ½-Anna shew the three strokes of the central numeral joined togetherprobably owing to a dirty condition of the die, but in the deeper black prints the strokes are generally clearly defined. An unused 4-Annas stamp is known shewing clear traces of a preceding printing from the die in red. Bright blue. All the bright blue denominations are moderately common unused, but they did only a very slight amount of actual postal service. Used copies of the ½-Anna and 1-Anna are of great rarity. The latter is, indeed, only known from a single example in the Yardley collection. Masson’s collection could only shew the 4-Annas used, and we only record the ½-Anna from a cover which was originally in the Hancock collection. Col. Hancock noted that he was not satisfied that the black seal obliteration of this stamp was genuine. 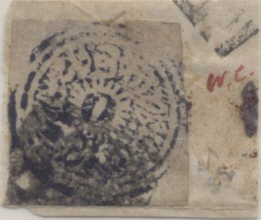 An examination of other postmarks on the cover does not, however, lead us to share this opinion, but it is much to be desired that other used copies of this value should be discovered and recorded. ...fairly common unused, and all are known genuinely used (though they are rare in this condition) at dates between February and December, 1876. “Indigo-blue.” A rare printing of the 1-Anna is known in a colour so far removed from “bright blue” that it should certainly receive separate classification in the event of an authentic used specimen being found. The shade of colour so closely approaches that of the indigo of the 1867 Circulars that the two might easily be confused. In order to avoid this we have coined the term indigo-blue. With this shade a distinctly brighter blue than indigo is noticeable wherever the colour is thinly applied; the paper also is, we think, rather more smoothly surfaced than that of normal 1867 paper. Yellow. The yellow stamps are scarce unused, and the ½-Anna only is known in authentic used condition, in which it is of great rarity. We should be inclined to doubt whether these stamps could have been made, primarily, for collectors. Masson’s suggestion that this very distinctive colour might have been intended to represent that of the orange or orange-red stamps (which had been applied for by dealers), does not appear very convincing, particularly when it is recalled that the latter were actually being used when the yellow printings were made. No order for a definitely yellow stamp could have been given with a view to securing some earlier impressions since none of these, nor the “Die I.” forgery, had ever been printed in such a colour. Printing in these “special” watercolours appears to have ceased at the end of 1876 or early in 1877, and we now proceed to the oil-printed stamps, which commenced in July of the latter year. Before doing so, and in order to throw some much-needed light, both on this difficult group and its watercolour predecessors, it becomes necessary to put the read in possession of the essential details of what became known as The Simons Controversy. ► Chapter V continued: The Simons Controversy.